When Athar and his friends realized who the target of the half-hour raid was, they were shocked. "I don't know what to say," says a visibly incredulous Durrani. "What does one say in these situations?" For years, he had heard of bin Laden's name. He had heard that he might even be in Pakistan. "We never thought he would be here, though," Durrani says. The raid seems so surreal as to merit a fantasy comparison: "It reminds me of the game Call of Duty: Modern Warfare that I play on my Xbox." Similar feelings of bewilderment were much in evidence throughout the rest of the town, as residents tried to return to their ordinary lives, often wearing expressions of head-scratching bemusement. Other residents are demanding proof. "We heard rumors before; then he shows up in a video," says Durrani. While a series of opinion polls in previous years have registered frightening levels of support for bin Laden, the reaction to the news of his death has not reflected this. There used to be great shows of support for the man some in Pakistan perceived as a champion of their anti-American hostility. In Abbottabad, feelings about bin Laden's death almost don't register. "We aren't happy, and we're not sad," says Mohammed Ishtiaq, a junior government officer, echoing many. 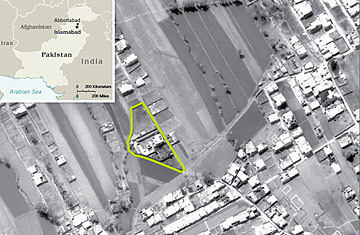 In some ways, Abbottabad was the ideal hiding place for bin Laden. Squeezed between the Pashtun-dominated frontier, where militancy has thrived in recent years, and the bustling heartlands of the Punjab, the Hazara region is an oasis of relatively prosperous calm. From the capital, Islamabad, the journey is a slow three-hour drive, snaking up and around sometimes dizzying bends. Along the way, visitors pass sensitive military installations but also plush fields that reveal a view of rising mountains. Named after Major James Abbott, a 19th century colonial officer, the town is an exhibition of colonial and martial traditions. Burn Hall, a near replica of a British boarding school, is sprawled over several acres on the west of the town. It was the orderly calm and surrounding beauty that lured Athar and his wife here. Bin Laden's presence and death may give him reason to revisit that view. "It's ironic," he says. "I left Lahore because of the bombs, then I come to Abbottabad and find out that bin Laden lived here." Like many Pakistanis, he is now confronted by two pressing questions. Why weren't the country's much-vaunted intelligence agencies able to track the arch-terrorist down? And if they knew where he was, why did they choose to hide that knowledge? See pictures of Osama bin Laden. See pictures of the devastation on Sept. 11, 2001.